InSanity lurks Inside: Zoo Miami turns Theme Park? ...Maybe. Zoo Miami turns Theme Park? ...Maybe. Zoo Miami turning into a Theme Park? In 1992 Hurricane Andrew decimated Miami Zoo, causing thousands in damage and killing some animals. Since then it seems the now called "Zoo Miami" has been in talks with various companies over the years above changing the zoo and the land around it. Theme Parks/Amusement Parks and the Miami Zoo have a rather long history, rumors have been around since the 1970's. 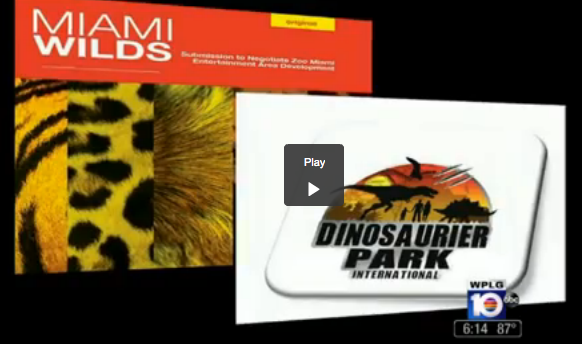 This week it came to light that two projects are competition for the rights to build at and around Zoo Miami. Beginning this Monday, both companies will begin trying to pitch their plans to the Miami-Dade County Leaders. Theme Parks/Amusement Parks and Zoo Miami have a rather long history, rumors have been around since the 1970's in some form or another. Two Companies have very different ideas about the area. The Garden Fair is home to the largest open air dinosaur exhibition in Europe. More than 80 life-like dinosaur replicas populate the Neumühle Park, including the only 30 centimeter long hylonomus and the 27 meter long diplodocus. The other proposed project is much larger and more intimidating called "Miami Wilds" and is backed by none other then 20th Century Fox. The newspaper states their proposal is "a theme park with rides based on its blockbuster movies. It would include an Ice Age-themed water park; 30,000 square feet of space for stores and restaurants; an outdoor space for concerts and sporting events; and, a 400-room hotel". 20th Century Fox states their project would be two phase, complete 'possibly' by 2020 after groundbreaking. One thing that strikes me as odd, neither of these 'proposals' address the fact that this is a working, breathing zoo. What will happen with the animals who call Zoo Miami home? Will the 'zoo' be kept, intact and operating or will this new project demolish the zoo? Personally, before Hurricane Andrew happened the Miami Zoo as a gem, an amazing zoo with amazing animal care programs. Afterwards, I can't tell you much as I was never able to return there in the following years since. InSanity lurks Inside will be following up on these proposals and will report back when more news or rumors come to light. Hurricane Andrew was in 1992, not 1994 (my first hurricane! :( ). But since then, Zoo Miami (formerly Metro Zoo) has been going strong. It's actually one of the better zoos that I've been to. The animal care programs are still there. Lots of animals, and great attractions. They've even added a large kids area that is themed around an Amazon rainforest. The only drawback is that Miami gets HOT and there's a large section of the animal exhibit trail that offers practically no shade. There's plenty of land around Zoo Miami to build on, so I don't think the Zoo itself is in any jeopardy. I'm wondering how risky such an investment is though. Zoo Miami isn't exactly close to South Beach, Downtown, or any other "touristy" spot in Miami. Most people not from Miami even know there is anything of significance south of Downtown Miami. It's probably why the old Parrot Jungle moved from the Old Cutler area not too far from Zoo Miami to the downtown area on I-195 in between downtown and South Beach. I'm intrigued by this, but remain skeptical as well. Oops. Sorry I got the dates wrong, I've corrected that. I remember in the past Miami Zoo was suppose to be a show piece but we never made it down after Andrew happened, I also know some parts never got replaced. I just wonder if a theme park is the proper way to support the zoo or if the zoo would eventually be phased out? Land in Miami isn't cheap and using the zoo to get in.. maybe I'm just being a skeptic but a theme park seems a risky way to go about it.